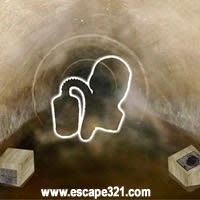 Prison Ruins 2 is point and click escape game developed by Ainars for MiniArcadeBox and sponsored by Escape Fan. Explore this ruined underground prison, search for artifacts to please lost souls of warriors, ghosts and activate portals to different locations. Complete different semi-dificult puzzles to obtain area scanner tool, scan the area to obtain 18 valuable crystals and exit key(19 items). Use exit key to escape. Good Luck!